Edutopia is George-Lucas-backed site that’s dedicated to sharing evidence-based, K-12 learning strategies. The producers of the site created a page with all their articles on assessment. One author to follow is Terry Heick. In one article, he talks about ways to honor the learning process. His point is that since understanding is a fluid thing, so should the assessment of that understanding. For those of you interested in project-based learning (PBL) and moving away from traditional paper-and-pencil testing, Andrew Miller shares some critical assessment ideas on the practice. Similar to Edutopia, TeachThough aggregates all their assessment content in one place. Directed by Terry Heick, TeachThought’s mantra is simply “learn better.” Their pieces offer tips on how to reduce student anxiety before exams and unorthodox assessment strategies. If you’re interested in this format of articles, I suggest starting with Grant Wiggan’s piece about myths of standardized test preparation to avoid. Carolyn Durley is a high school science teacher in Canada who runs a blog called A Fine Balence. She writes frequently and focuses on the culture of her classroom. I chose to highlight this blog because Carolyn is a healthy mix of talking shop and recognizing the emotional aspects of learning. A fine balance indeed. Like the pages of aggregated assessment content, Twitter is a great way to find what you’re looking for. The key is using the right search term, or hashtag. If you search using #testchat, you will find educators and writers tweeting their best blog posts. In addition, you can join the conversation of people all about assessments. #AssessmentChat exists, but it’s not very active. Last but not least, we did not forget about our elementary school teachers. If you are looking for resources, or “freebies,” like activity ideas or letters to send home to parents during testing season, this is a fun site to start with. For those of you who want to delve deeper into the assessment conversation and will be in the Boston area March 6, join us at our third Gradeable Social. We’ll be discussing high-stakes, low-stakes, and alternative assessments and would love to hear your thoughts. 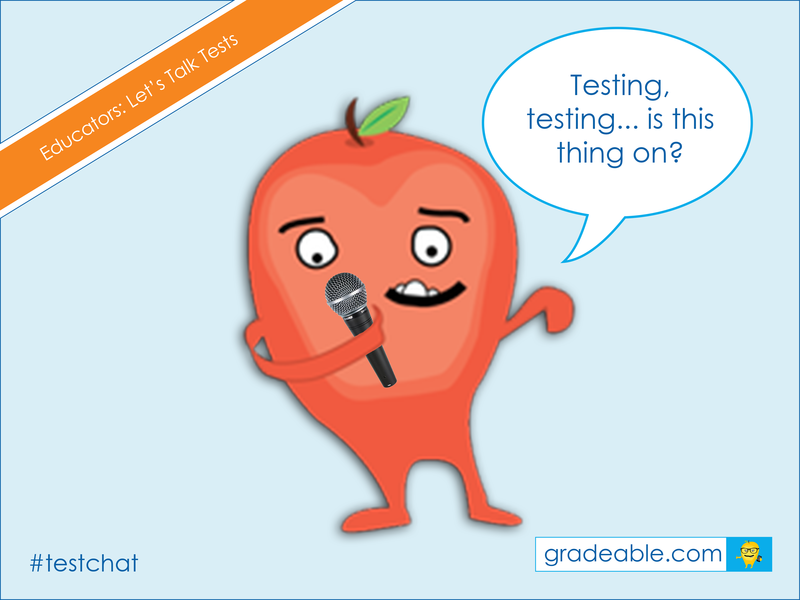 If you have any questions, please email bon@gradeable.com.